Dogtown businesses celebrate the community's traditions. The sensational tale about Dogtown and the World’s Fair refuses to die, says Bob Corbett, 77, the keeper of Dogtown history. “It’s just silly,” said Corbett, who’s been debunking the myth for years. He’s a retired Webster University philosophy professor who grew up in Dogtown, left for 30 years, and then returned to the neighborhood in 1993. That’s when he began researching and collecting Dogtown history. He’s a board member of the Dogtown Historical Society, which he founded in 2002. Corbett has an extensive collection of Dogtown material, and he shares his research on his website. So how did Dogtown get its name? Well, it might (or might not) have to do with coal mines and watchdogs, which, Corbett says, is the other popular explanation. But there’s no official record to check because … Dogtown isn’t an official place. If you look at the city’s list of 79 neighborhoods, you won’t find Dogtown because it’s not an official neighborhood of the city of St. Louis. “We call it Dogtown. 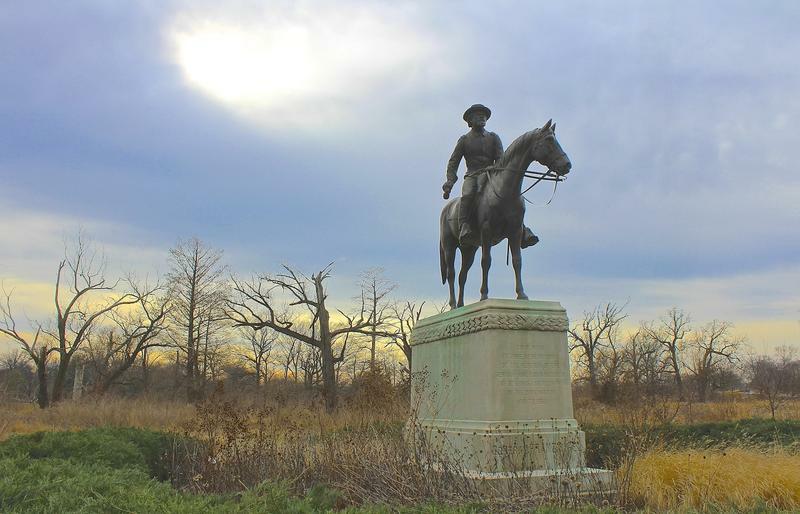 Almost everybody in St. Louis calls it Dogtown, but the city doesn’t formally recognize the name of Dogtown,’’ Corbett said. Instead, Dogtown encompasses several official city neighborhoods, including Clayton-Tamm, Hi-Pointe, Franz Park, Cheltenham and a wee section of Ellendale. 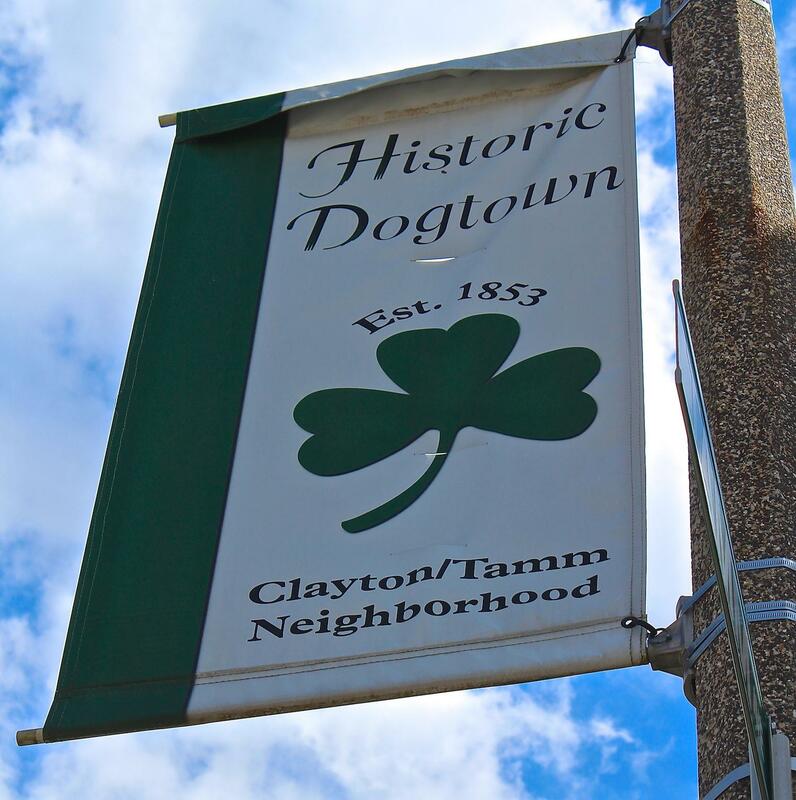 Dogtown was traditionally a blue-collar Irish-American neighborhood. According to Corbett, the boundaries of Dogtown are generally defined as: Oakland Avenue to the north, Macklind Avenue on the east; Manchester Avenue to the south (except for a section between Hampton and Dale avenues that juts under Highway 44) and the Maplewood city limits (around McCausland Avenue) on the west. He says the historical society first determined Dogtown’s boundaries when it was incorporating as a nonprofit, but has made some slight adjustments over the years. For example, the western boundary was extended to include some homes on the west side of McCausland that were clearly part of the original neighborhood. Dogtown doesn’t always appear on maps of the city, but that doesn’t matter to Corbett. The Dogtown area was once known for coal mining and brick-manufacturing, according to Corbett. The area had large deposits of coal and clay, but it took the railroad to spark development. “There were numerous attempts to mine it and get it to the riverfront to be shipped out, but the clay and the coal were just too heavy. Even with huge oxen teams they couldn’t get it to the river. There was no way to move it,’’ he said. That changed in the early 1850s, when the Pacific Railway laid 5 miles of tracks from the city into the countryside. Corbett says the original station was about where the Hampton viaduct bridge is today on Manchester. And there was a Catholic church. St. James Parish, at the intersection of Tamm and Wade, dates to 1860. Most of the early residents were immigrants who came to work in the mines and the brick-making factories. Many were from Ireland, but others came from Germany, France and the Balkans. The area was originally known as Cheltenham. Its history was detailed in a 1937 book written by the Rev. P.J. O’Connor, the pastor of St. James. According to O’Connor, an English colony of Quakers established a factory to manufacture clay products at the site, which was originally called Sulphur Springs. O’Connor wrote that Dogtown was “so-called by squatters who built shacks in the neighborhood of Graham and West Park in 1876.” According to this theory, the squatters were miners who were displaced when the city bought the nearby land for Forest Park -- and they had watchdogs to protect their shacks and belongings from hoboes riding the rails. 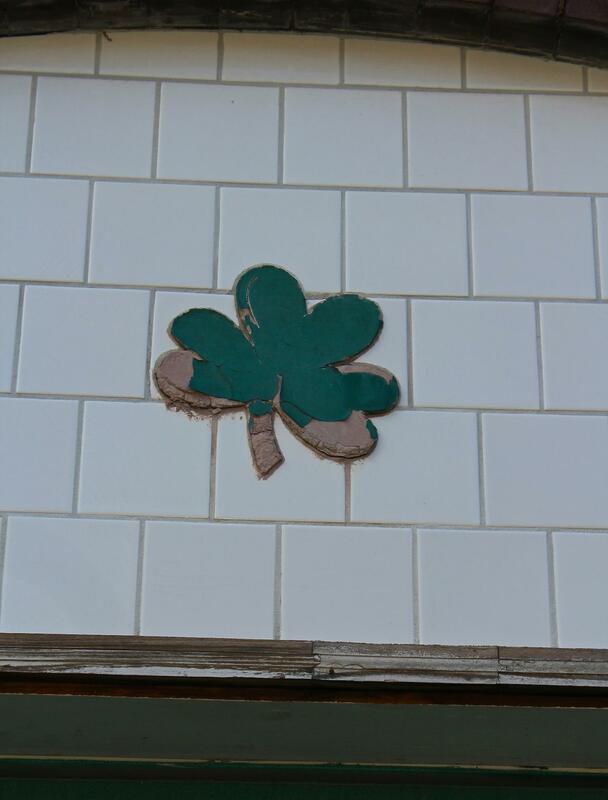 Shamrock on a Dogtown street. Corbett credits O’Connor with giving rise to the theory that Dogtown was named for the miners’ watchdogs. And he’s made it his mission to track down the origin of the World’s Fair myth. When he began studying Dogtown’s history, he conducted interviews with many of the older residents of the community. “All the older people -- when you asked them about the Dogtown name, and I went around asking everybody -- nobody ever gave me that story,’’ he said. Corbett says the World’s Fair theory didn’t become popular until the 1980s. He believes the story got going when Seamus McDaniel’s, a popular local haunt, added the lore about the Igorots to its menu. Though the Philippines exhibit was nearby, in what is now the Wydown-Forsyth National Historic District in Clayton, there is no evidence about dog-hunting during the fair. In fact, Corbett said, it was the city that pressured the Igorots to perform the rituals as part of the World’s Fair hype. And the city arranged to provide the dogs from local pounds. A few years ago, some longtime Dogtown residents developed their own theory that the name derived from mining terminology. You can read all about it here. A St. Patrick's Day parade in Dogtown. Corbett lives in the house his parents built, next door to his brother. Another brother lives just up the street. That’s not unusual for the neighborhood, where some residents are third- and fourth-generation Dogtowners. Like The Hill, it’s a neighborhood where families have put down roots for generations. “There are many people who have real history here,’’ he said. Dogtown, which was traditionally a blue-collar Irish-American neighborhood, is seeing some changes -- particularly on the west side where more affluent residents are buying older homes and replacing them with larger homes, Corbett said. He says the neighborhood is known for its neighborhood bars and eateries and the annual St. Patrick’s Day parade sponsored by the St. Louis Ancient Order of Hibernians. The parade can go on for hours because the emphasis is not on fancy floats but on “clans” marching. Living in Dogtown is like living in a small town in a big city, Corbett said. Editor's Note: According to John Haller, here's a little more on the theory mentioned in the story that Dogtown's name was derived from coal-mining terms. The originators of the theory were Tom Haller and Michael Gittins. Haller's great-grandparents immigrated to the area in the 1800s to work in the mines and later built Kies Bakery. Gittins' family owned the Gittins Hotel, built around 1850. He was told the story by his relatives.